What a joke of an EPA Administrator. SCOTT PRUITT is not unlike an oleaginous energumen on steroids. Is this what TRUMP voters wanted? WASHINGTON — Scott Pruitt, the administrator of the Environmental Protection Agency, has removed himself from some of the most contentious cases facing it, including challenges to the Obama administration’s Clean Power Plan and a controversial rule related to the Clean Water Act. 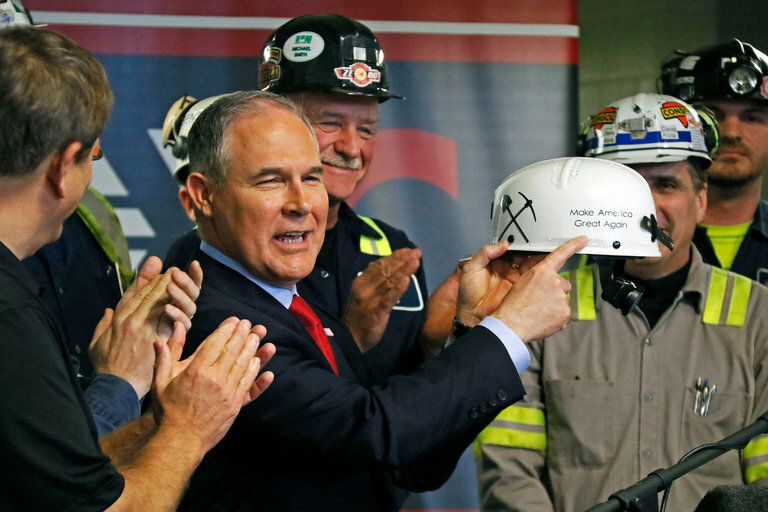 Mr. Pruitt’s decision to recuse himself, announced in a memorandum dated May 4, involves legal cases he had been a part of during his prior tenure as Oklahoma’s attorney general. In that role, Mr. Pruitt had been one of the most active state officials in bringing lawsuits against the agency he now leads, challenging federal environmental rules. His recusal had been demanded by Democratic lawmakers. The memo was obtained by E&E News, a site that focuses on environmental and energy reporting. During the hearing, Mr. Pruitt said he would not commit to removing himself from all the cases he had brought, though some might be subject to a one-year period of recusal. In his memorandum describing the decision, Mr. Pruitt said that, after conferring with the ethics office of the agency’s general counsel, he understood he was required to take a “one-year cooling off period” on issues concerning his former employers and clients. That included the state of Oklahoma and the Rule of Law Defense Fund, a policy group that allowed companies benefiting from legal actions taken by Mr. Pruitt and other Republican state attorneys general to make anonymous political contributions. One of the Democratic senators who had called for recusal, Sheldon Whitehouse of Rhode Island, said Mr. Pruitt’s action did not go far enough.